I have to admit it’s a complete mystery to me how I can get an internet connection in a little traditional Japanese hotel on a mountainside, but not in a huge Western-styled one just outside of Kyoto. The mind boggles. 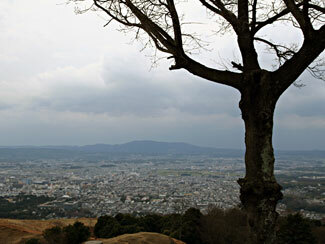 On day three we bid farewell to Nara and began the rather long trek towards Kyoto. First there was a stop in Uji City, on the outskirts of Kyoto, for a visit to the Byodoin Temple. This complex comprised several buildings, the main of which is Phoenix Hall, home to statues of another giant Buddha and 52 attendant Bodhisattvas on clouds. We didn’t actually go into the Hall itself as it was an extra charge on top of admission to the grounds, but that’s not a really big deal since there were replicas of everything in the temple museum (Hoshokan), which didn’t cost extra. After the Byodoin, we attended a traditional tea ceremony almost next door and then it was back on the bus for lunch in Kyoto proper. 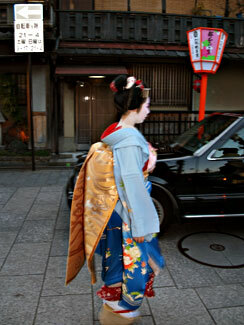 We went to an Ochaya-san and were treated to a rather elaborate performance from a Maiko. After that we hightailed it to make an appointment for a tour of the Suntory brewery, but were running so behind we had to settle for the abbreviated version (paraphrased – “This is the water, barley and hops. These are large machines that make beer. Have some beer”. For refreshing time, make it Suntory time indeed. Side note – driving a large tour bus through the streets of Kyoto is slow going. Just in case you were wondering. The next stop was downtown Kyoto and a chance to actually experience a bit of Japanese urban life – a nice change from all the austere and historical-ish temples and shrines we’d seen thus far. I spent most of the time trying to track down a 3-prong to 2-prong plug adapter and was happily successful, finding one in a most peculiar sort punk rock department store. Yeah, that’s what I said. Otherwise I wandered about a couple of large retail avenues and just soaked in the atmosphere. The final stop of the day before the hotel was the Gion quarter, which we were told was exciting because of its role as a location in Memoirs Of A Geisha. I guess that’s exciting. It was kind of funny watching all the tourists camped out in the street, cameras at the ready, hoping to catch a Geisha passing by. Efforts for which they were eventually rewarded (I saw three) but it just seems strange to make such an event out of someone simply walking to work. The massive and opulent, yet internet-less, hotel we’re staying at is just outside Kyoto on the shores of Bitwa-ko, Japan’s largest lake. This place is built like a castle. And oh yeah – it snowed. SO not part of the original deal. The second day of the trip was again spent in Nara. One of the big selling points of the hotel we were staying at was the hot spring spa, which I partook in this morning. And damn if it wasn’t comfy. After breakfast, again of the highly traditional type, it was back to Nara Park for more canoodling with the sacred tame deer. There were far more here than on the mountaintop yesterday, and they were far more aggressive in checking out your pockets for food. But they’re so damn cute I really didn’t mind them nibbling on my coat or tour book. Thankfully deer feed was cheap and plentiful so it was easy to make friends with them, at least until the grub ran out. It was funny to see one small kid taunt the deer a little too much and get butted to the ground for his troubles. No one hurt, but satisfying to see. The main sight in the region of the park we were in was the Todai-Ji temple, the main building of which is Daibutsuden, a gargantuan wooden structure – the largest wooden structure in the world – which houses a 50-foot Buddha. Very impressive, though I was disappointed that no giant moths or lizards appeared to challenge it to battle. That’s two days now without a Mechagodzilla sighting. Maybe I need to be closer to Tokyo. After lunch it was off to another portion of the park, the Kofukuji Temple, built in the 1400s as exact reproductions of buildings dating back to the 700s. The complex consisted of several buildings including some impressive pagodas and a main temple which again housed more Buddhas. Where we were off to next, I’m not entirely sure since I fell asleep on the bus. Near as I can figuure, it’s about an hour outside of Nara and near the borders of Nara, Kyoto and Osaka and fairly high up on a mountaintop. The hotel has more hot springs (a guy can get used to those!) and is a short walk to yet another temple complex, this one more picturesque as it’s built onto and into the mountainside. So far it’s my top pick for site most likely to house a secret warrior ninja-monk society but they haven’t revealed themselves. Yet. For the two days we’ve been here, the weather has been both cruel and erratic. Tuesday was all about the rain and yesterday was just damned cold. With a dash of rain. Needless to say, I hadn’t packed for anything quite so blustery so it’s been a bit of a struggle with the elements. It seems to have eased up a bit today, though, so god willing I won’t have to wear the entire contents of my suitcase to stay warm. Plus I think we’re going to be in Kyoto proper today, so less wandering around the countryside. My laptop is down to the very last nub of power. The Japanese don’t believe in grounded outlets. As such I’m keeping my computer activities to a minimum. Writing, posting. No photo processing so those’ll have to wait till I’m back in Taipei this weekend. But for now, enjoy the fawn up above. Awwww. Okay, that’s a total lie. I’m nowhere near Budokan. Kansai International Airport is a mammoth, ultra-modern facility located on a man-made island some kilometers south of Osaka. On the drive in, the next thing you notice is the rather astonishing road system in Osaka. The highway overpasses, bridges and whatnot form an epic, serpentine circulatory system through the city that quite frankly looks like a work of art, even if you’re not into highways in general. The opportunity to marvel at Osaka up close would have to wait for another time, however, as it was not our destination on this day. We zipped along in our tour bus through and out of town, headed to the city of Nara, a little ways away. 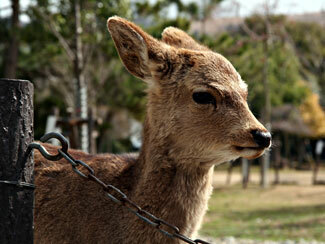 Nara is famous for being home to Nara Park, which itself is home to hundreds of awesomely tame deer. We went up to the top of one of the mountain/hills surrounding the city to a) freeze our asses off (it was muy windy), b) frolic with the deer a bit and c) get a spectacular view of it all. Check, check and check. It was at this point as we headed back into the city that the weather, and the day in general, started to turn south. Though not in the forecast (you lie, Weather Channel! ), we got hit by a large, very persistent thunderstorm and the tour guide still thought it would be a good idea to wander around on foot through one of the city’s neighborhoods. Granted, it was kind of a neat area with incredibly narrow streets and low, densely packed buildings whose roofs looked tailor made for ninja sprints, but it was also freezing cold and wet so the novelty of it all was rather being washed away. After we finally got back on the bus and pneumonia was settling in nicely, it was a long traipse to the hotel, which was of a traditional Japanese style. This meant no beds, no three-prong plugs and no internet. Nothing traditional about the internet. It also meant we had to put on kimonos and traditional garb to go to dinner, which was beautifully presented and consisted of stuff that you don’t get in Bento box #3 at Sushi On Bloor. Some of it was tasty, some not so much, but it was certainly different. Jet lag continues to plague me on this trip. I think the only thing worse than traveling halfway around the world in the first place is to keep getting up at odd hours to catch more flights to more different time zones. I was unconscious before 9PM local time and up before 4AM, and see no end to this trend in sight. Oddly, though last night was spent in a hotel in the city, there was no internet. Now that I’m in this remote little hotel on a mountainside, there is internet. Go figure. However, there is no 3-prong plug so my laptop battery continues to die. Perhaps I will try to ask for an extension cord in sign language at the front desk. Margot & The Nuclear So And So’s new/debut record The Dust Of Retreat comes out today and The Indianapolis Star has an expansive article about their favourite native sons (and daughter). 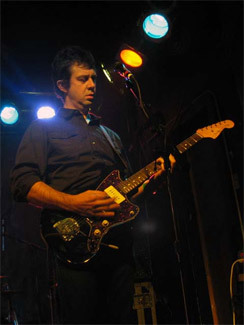 The band is also used as an example of “intellectually sensitive” bands whooping it up at SxSW last week by Connecticuit Music. There’s also an audio interview with the band recorded at SxSW at Gen Art Pulse. I posted a couple tracks from the album in my last Margot post but also check out their ecard for more samples, videos and miscellania here. Finally, a reminder that they’re at Lee’s Palace on April 3. You should go. Wayne Coyne of The Flaming Lips tells The San Francisco Chronicle that he doesn’t do drugs and that it’s hard to get fake blood out of his suits. Billy Bragg talks to CNN about being influenced by Bob Dylan and Margaret Thatcher. Bradley’s Almanac has recordings of Billy’s recent Boston show for grabbing. The new album from The Sleepy Jackson will be out July 25 and look for a new Fountains Of Wayne album sometime this Fall. 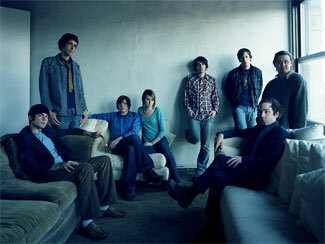 Some shows – Band Of Horses are at Lee’s Palace on June 13 with Mt Egypt. tickets $10, while Islands and a host of their friends including Frog Eyes, Sunset Rubdown, Cadence Weapon and Bus Driver, will be at the Opera House on May 19 for an all ages show, tickets $13. Also, Rainer Maria will be at the Horseshoe for what will hopefully be an emo-free bill on May 15. But don’t look for any tour dates for Morrissey anytime soon – he hates Canada. Monkey vs Robot – my money is on Robot. So yesterday was the first full day in Taipei and it was a drencher. Didn’t stop raining for pretty much the whole day, and this was no namby-pamby rain. But still, we were able to head downtown for a little look-see, mainly in a system of fancy-pants malls outside Taipei 101, which currently holds the much-asterixed title of “tallest building in the world”. It was way too cloudy to go up, so perhaps I’ll be able to defend my hometown phallus’ honour another day. But most interesting was looking through the CD section in a huge international bookstore in one of the malls. It was quite small, but well-stocked with releases from Art Of Fighting, Smoosh, +/-, Vashti Bunyan, Trembling Blue Stars and Explosions In The Sky – and all at quite good prices. I had no idea what to make of this, but it made me happy. Today we’re off to Japan. I believe we’re going to see some deer. If you want to follow along with pictures, I’ve got a set for this trip on my Flickr page. Recieved a most exciting piece of email the other night from none other than Mr Dean Wareham, formerly of Luna. It seems that they’re assembling the artwork for Tell Me Do You Miss Me, the DVD documenting Luna’s farewell 2004/2005 tour, and they wanted to use one of my pics of Sean Eden from their Abbey Pub show in Chicago back in November ’04 for the booklet. I think it’s this one here, but there’s a few decent Sean ones they could have selected. Either way, it was pretty exciting to be getting my photo in the artwork and to correspond with Dean, if just for a little bit. The trailer for the doc, which is premiering at the Tribeca Film Festival in NYC next month before arriving on DVD in May, is also now online. I’m a little surprised by the direction that the film appears to take – rather than just a concert video collated from the farewell shows, there looks to be a fair bit of backstage and candid footage with a definite look at the business end of things that no doubt played a huge role in the band’s decision to call it quits. I’m a bit of a tough sell on concert filims in general, so this angle could make for a much more interesting viewing experience. Hope I get a copy as a thank-you for the photo… oh, and Rhino, who are releasing the DVD, are also putting out a best-of for Luna in May to coincinde with the film. No track listings yet, but if Rhino stays true to forml it’ll be an excellent mix of album tracks, b-sides and rarities. And looking to the future, Dean & Britta have gone into the studio to record their second full-length album. Tony Visconti, who is again producing the duo, and on his website, he says “The latest batch of songs are, of course, romantic and heartfelt (and they make my eyes a little dewy — but it’s just a physiological thing, nothing to worry about)”. There’s some stuff to listen to on their MySpace page and The Squid & The Whale, which they provided the score to, came out on DVD last week. Also retrospecitve-y and coming from Rhino in May (on the 23) – a Replacements best-of entitled Bastards Of Young which, unlike the feeble All For Nothing/Nothing For All set compilation from a few years back, should include selections from both the band’s Twin/Tone AND Warner Bros releases. And if that’s not enough ‘Mats for you, PunkNews has info on a box set being compliled for a future release. Via Clicky Click. Sonic Youth’s final album for Geffen, Rather Ripped, will be out June 13. More info at Chart. Pitchfork reports that The Mountain Goats will release a new EP, Babylon Springs, on April 3. Initially only available in Australia, it will hopefully get a North American release in some capacity before too long. And finally, the band have recorded their follow-up to The Sunset Tree and aim to release it this Fall. Magnet has questions, Wayne Coyne has answers. They go together like ramma lamma lamma ka dinga da dinga dong. Preview selections from The Concretes’ new album In Colour here. It’s out April 4. Thanks to Coolfer for the link. The Times revs up for the release of Drive-By Truckers’ latest A Blessing And A Curse, out April 18.